So you want to adopt a puppy. Good for you! Adopting a puppy can be a wonderful experience and can bring you and your family fun and joy for years to come. It is our hope that this article can help make your puppy adoption experience as smooth and fun as possible. Puppy Adoption – Are You Prepared? Time and dedication: you need to have time to spend with them. Dogs need to interact with their owners. They cannot be ignored just because you are busy or tired. Before you adopt a puppy, think if you will have time to spend with your new friend in play and exercise. Chances are, you are going to be your new puppy’s entire world of companionship. Dogs are wired as pack animals where companionship is constant. Your new puppy needs your love and affection as often as you can possibly give it. If you spend time with him and if you go out to walk with him (even on rainy or cold days), even when you get tired from work; He will be waiting anxiously and want to leave after being alone for several hours. Before you adopt a puppy, you need to consider the four major factors that must be decided in order to have a happy and successful experience with your new companion. 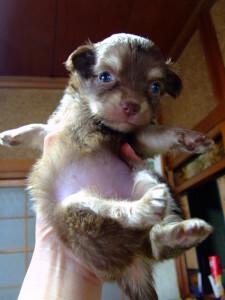 Adopting A PuppyWithout a doubt the most important decision when considering a puppy adoption is the size of the full grown adult that you want and your situation will allow.How much room you have, both within and without is one factor.Larger dogs need more room to move, run, and play. In compact spaces they are likely to knock items off shelves and tables with their wagging tails.While smaller dogs can be perfectly content in a smaller space.Another consideration that you should be aware of is that large dogs eat considerably more than smaller dogs. Which means higher cost and more poops to clean up.If you are adopting a puppy that is not a purebred it may be more difficult to determine the size to expect the full grown adult to achieve. Fortunately, there are some indicators you can look at to get an idea. First, look at the size of the mom and, if known, the size of the dad. A good estimate is that your adult puppy may fall in between the size of the two. Another indicator is to look at the size of the puppy’s paws. Larger paws usually indicate a larger adult while small paws may indicate a smaller adult. This decision can be critical for some people. Long hair breads will leave more shed hair around the house to be cleaned up. They also require more frequent grooming. For allergy sufferers, short hair breads may be a better choice. Some people prefer male dogs, some females. This is really just a personal choice, but if you have a preference that will drive your choice of puppy. When considering puppies for adoption, some care should be taken to make sure the source of your new puppy is reputable and safe. Unfortunately there are many puppy mills that are just not up to par in caring for their dogs and puppies health. Make sure the puppy has had all its appropriate shots and vaccines before making your decision. He should be vaccinated against worms, parasites, rabies and other common diseases that affect puppies. If the puppies have not had their shots it could be a sign that they have not been properly cared for. It could be that the breeder is not willing or able to pay the costs to keep up with the puppies’ health. Or there could be a more serious reason they are unwilling to have the puppies seen by a veterinarian. Interacting with the puppy before adopting it is very important. You should not choose a puppy based solely on their appearance. Take time to play with it and to make sure that you two are a good match. 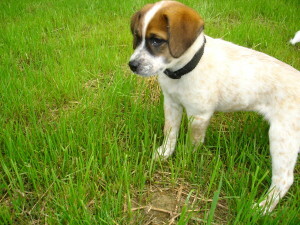 Most puppies will be lively and playful, although some may be shy at first. Allow time for the puppy to come out of his shell and get involved with you. Before adopting a puppy you need to understand that there will be ongoing costs involved to keep your new friend healthy and vibrant. Some of these ongoing expenses are detailed below. All dogs, regardless of breed, need to be on a regular maintenance shot schedule. Note that there are costs associated with this and that the costs vary widely based on which veterinarian you use. Check with your favorite veterinarian to get an accurate idea of needed shot schedule and costs. Female puppy’s are spayed while male puppy’s are neutered. According to the Humane Society, the procedure prevents more unwanted animals from entering shelters and potentially being euthanized. Many communities require pet owners to have their pets spay/neutered. For more information on the potential benefits of the procedures visit the Humane Society’s website. 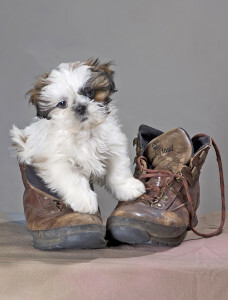 Depending on where you live you may be required to purchase a license for your puppy. Many communities require shot records before they will provide a pet license. Some communities also require your pet to be spayed or neutered unless you get a special license as a breeder. The simplest way to find out your communities requirements is to ask your local veterinarian. They should be able to tell you if licensing is required and where to get the license. Bringing home your new puppy is a very exciting time for you. But it can be a very traumatic experience for your puppy. Remember, your new puppy has just been torn away from it’s mother and siblings and brought into an environment that is unfamiliar. Be sure to treat them with an excess of love and affection. The first day with you, the new situation will generate some stress for your new puppy. He has to get used to a new home, new house rules and a new family. Let him be free to explore. Let him snoop around the new living space. Give him the freedom to explore his new surroundings and get used to it. Everything is new – new smells, sounds and objects. Let him explore different rooms and let him go snooping without scolding. Have some toys ready for him to play with. And above all, give him lots and lots of positive attention. 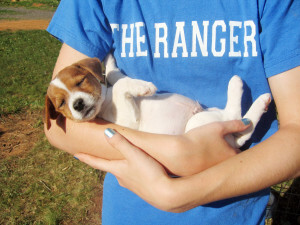 In his first outings, you should carry him to help him get used to the outdoor environment. He will experience a whirlwind of news sights, smells and sounds. People, caresses, noise, cars, motorcycles, buses, sirens, cries, movements of children in the park; all those stimuli will be part of his life in the human world. Holding him will help allay his fears of these unknown stimuli. All the while he will be learning to trust you. This simple exercise will help prevent aggressive, fearful or phobic behavior as an adult. Plan to use a high quality feed specially formulated for puppies. These will aid in digestibility, enhancing the absorption of nutrients and help keep your puppy healthy. Up to 6 months: 3 times daily. Up to 9 months: 2 times a day. From 9 months: 1 time per day. The quantity of food depends on the size of your dog and how active you keep him. Ask your vet for guidelines. Do not give your puppy or adult dog human food. It can have detrimental effects on his health. How Much Water Does My Puppy Need? Leave water in a container that cannot tip over, fresh and clean water all day long. Water should be constantly available to your puppy and adult dog. Keep in mind that as summer temperatures rise, more water will be required to keep the water dish full. Congratulations on your new puppy. Follow these tips and you will be well on your way to having a fun and exciting time.